POSSIBLE SPOILERS AHEAD. 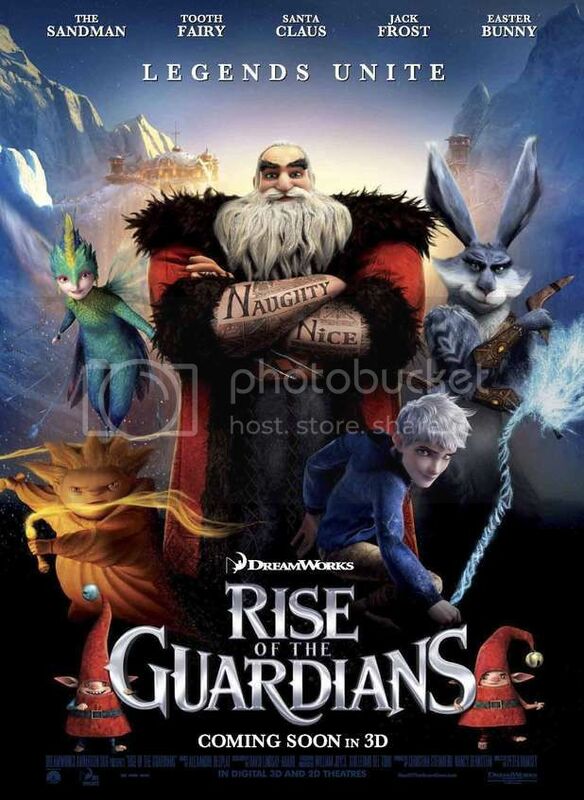 Rise of the Guardians is one of the best Christmas movies I've seen in a long while. Great message, awesome characters and a fun twist on the norm. We went to see the movie for our four-year-old niece's birthday, and I'm pretty sure the adults enjoyed it as much (or more) than she did. The main characters in the film—North, Tooth, Sandy, Bunny and Jack—are awesome alternate versions of tales most of us know well. I particularly love North's tattoos and his helpers (who, spoiler alert, are not really the elves). I want to hug Sandy and ask him to give me sweet dreams of unicorns. Bunny is hilariously rough around the edges. Basically—I love them all. The "moral" of the story is a good one about team work and discovering who you really are. It's not preachy, which children's movies can often get, and it's not totally predictable. Plus, the movie is just plain pretty. I highly recommend this one, for kids of all ages, and even if it's no longer Christmas. POSSIBLE SPOILERS AHEAD. So—I've never seen any other version of this musical, nor have I ever read the novel it's based on. I went into this movie not really sure of the plot, either. A total Les Misérables noob. Also—the main portion of the student rebellion scenes were shot on a barely re-worked Diagon Alley set. 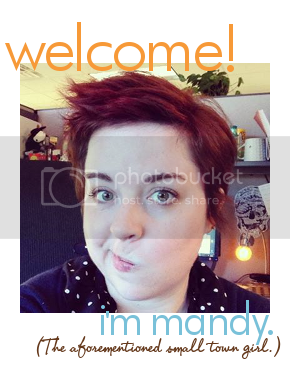 (Not kidding.) I wish I hadn't known that before seeing the film; I might not have realized it while watching and therefore wouldn't have been half-expecting a goblin to pop out of the barricade. Additionally, Borat and Bellatrix Sasha Baron Cohen and Helena Bonham Carter seemed out of place in such a serious movie. Are the characters they play supposed to be so farcical? Or were they just played that way in this film? These thoughts are probably sacrilege to all of my theater-loving friends, but perhaps if I'd seen this on stage before going to a very Hollywood produced-version, I might feel more of a connection? i haven't seen the movie yet, but i've seen the stage version 4 times and i've read the (horribly boring) book it's based on. i know the roles cohen and carter were playing and they are kinda the comedy team in a super depressing musical. so it's normal for them to seem farcical.. though i have a feeling it's more so because of who the actors are. Well, I appreciate at least that they were supposed to be in some way comical. My husbands job had a family appreciation party before Christmas and they screened Rise of the Guardians. It was amazing! The kids loved it. Yes, I like a tattooed Santa. I'm a total Le Miserables noob. I don't even think I pronounce it correctly. I did get the book on my Kindle and I plan to read it before I see the movie. 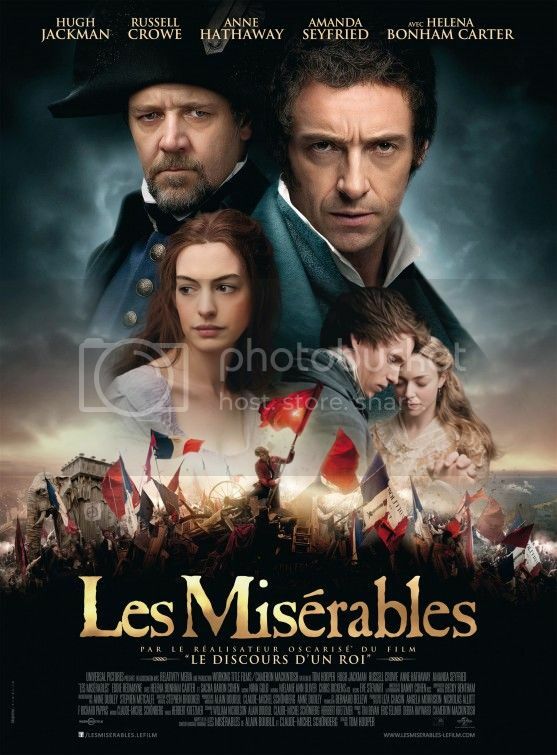 I'm a Les Mis noob too, and honestly I'm not that bothered about seeing it (even with Anne Hathaway and Hugh Jackman, who I love...) so it was interesting reading your review, everyone else who I've talked to about it has really loved the show so they love the film and its a bit weird if I'm honest. I will be looking out for Diagon Alley when I do get round to watching it though. I probably wouldn't have seen it on my own, but a couple of friends wanted to see it again. They love it and I felt kind of bad being all "meh?" when it was over. As a recovered musical theatre junkie, I 100% agree with your Les Mis review. I went in thinking the musical treatment would be what irked me, but it was most definitely the filming. Close ups are hella awkward. And Rebecca is definitely right - the Thenardiers are the comedy duo in the show, but I think the "extremeness" of their scenes in the movie also had to do with the filming. I saw the musical growing up and quite loved it, so I'm partially biased (as much as I liked the movie, I still think I like the actual musical better). And I did the same thing every time the Thenardiers came on screen xD I don't think I've ever seen them THAT farcical, though they usually are to some degree. They used Diagon Alley, seriously? That's awesome!